Say Seattle to most people and they think of two things: rain, and more rain. Okay, maybe the Space Needle and really bad sports teams, too, but let’s face it. Moisture and gray skies are what we’re most famous for around here and why not? Let other areas boast of their 300 sunny days a year. 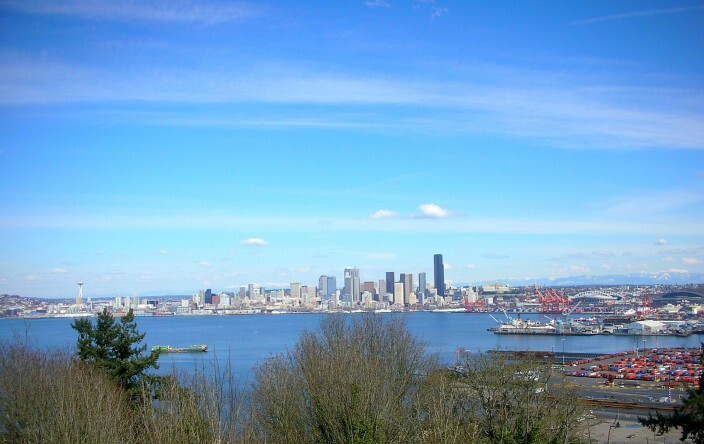 Seattleites will proudly puff out their chests and proclaim the beauties of 300 cloudy days, maybe 320 in a good year. Okay, so it’s kind of gloomy and dank and drippy and if you stand in one place too long moss starts to grow on you, but honestly, it’s not that bad. I mean being green is the coolest, hippest thing around now, right? So Seattle was way ahead of the curve on that one. And everybody knows too much exposure to old Sol is damaging to your skin, melanoma and all that, so no worries there. What’s so great about blue sky anyway? It always looks the same. It’s blue. Clouds, on the other hand, are never the same twice, come in an infinite variety of shapes and sizes and colors and let you use your imagination. Ever see anyone lay on their back in the grass staring up at clear blue sky imagining they see chariots or dolphins or animals floating by in the blue? Didn’t think so. Old joke. Guy moves to Seattle in October from the East Coast (or California or the Midwest or the South or just about anywhere else in the country) and it proceeds to rain almost every stinking day for the next six months. Finally he can’t take it anymore. He’s going crazy. He steps outside one morning and there’s a kid playing on the sidewalk in the rain. Yes, it can feel that way sometimes, but it does make you really appreciate the sun on those rare occasions when it does make an appearance. You know, once or twice a year. It’s a real event. People come out of their caves and squint at the frightening bright yellow orb in the sky, wondering what it might be and if they should sacrifice another virgin to the rain god to make it go away. Think I’m exaggerrating? Try growing tomatoes here in what passes for summer. You’ll see. 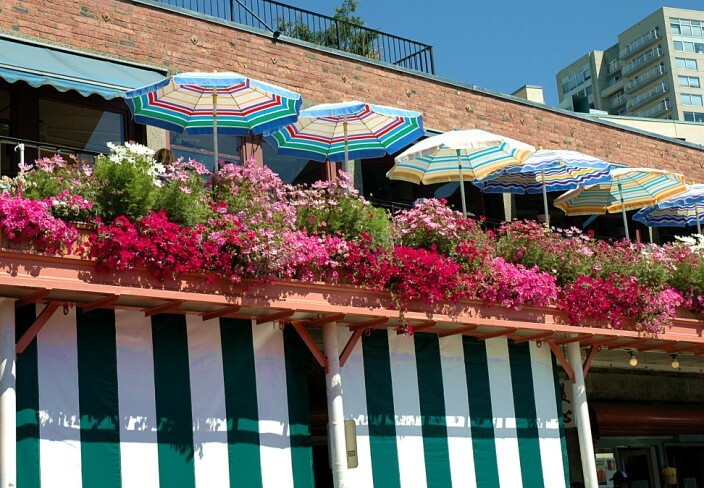 When does summer officially begin in Seattle? The 5th of July, the day after one more holiday barbecue gets washed out. But enough of this hilarity. 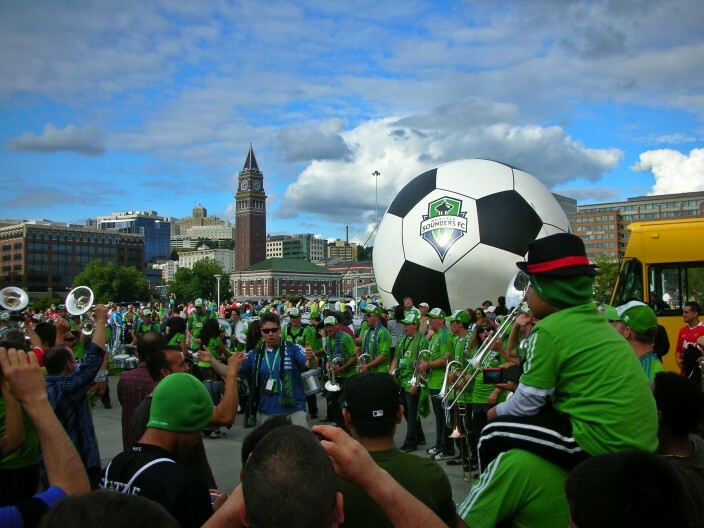 I wouldn’t want to beat the dead horse cliché of Rain City, i.e. Seattle, to death. 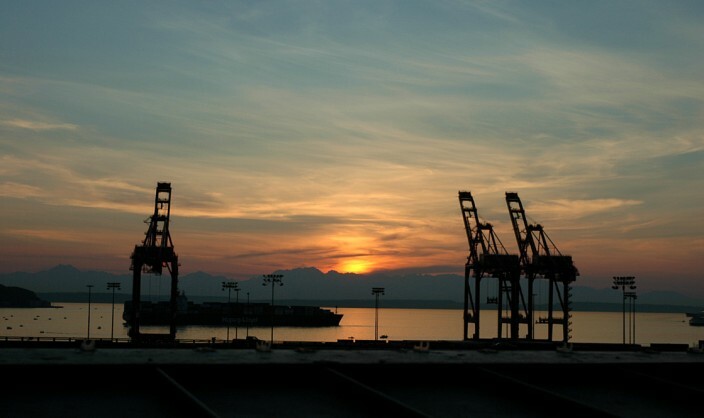 If you live in western Washington for any length of time, you accept it and live with it and go about your business. Otherwise it can eventually drive you stark raving bonkers or send you right back to whatever sunnier clime you came here from, shaking your head and wondering why in God’s name anyone would choose to live somewhere with such a foul and dreary climate ten months of the year. Believe me, I know, because there are days when, even after 45 years here, I ask myself this question. In fairness, let me state some of the benefits of western Washington’s unique climate by means of absence. Blizzards, droughts, scorching 100 degree plus heat waves, unbearable humidity, tornadoes, hurricanes – all of these phenomena are notably absent, either one-hundred-percent so, or mighty close to it. And when the sun finally makes an appearance – yes, it really does happen – the summer days are pretty darn spectacular, temps mostly in the 70’s and 80’s and even when it gets hot it always cools down nicely at night. So these are some honest, tangible advantages in terms of climate that a lot of folks around the U.S.A would gladly trade for. 2012 marks the fifty year anniversary of one of the seminal moments in Seattle’s history, the 1962 World’s Fair, an event that helped propel the city into both the national and international spotlight. 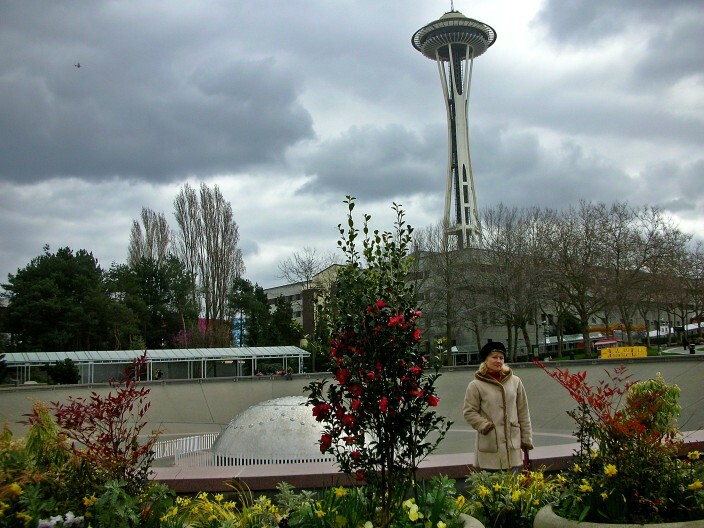 That most iconic of Seattle landmarks, the Space Needle, was built for the exposition, along with a myriad of other buildings and rides, some of which have since disappeared and others which survive to this day, such as the Monorail linking downtown to the World’s Fair site, the Pacific Science Center, and the International Fountain. 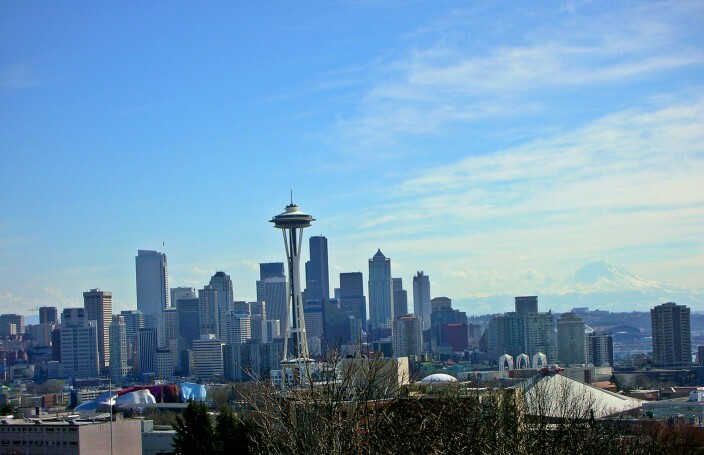 The old site of the World’s Fair, now known as Seattle Center, is today still a very popular tourist hub and simply a great place to hang out for tourists and locals alike. Children run and play in and around the International Fountain, everyone wants to ride up to the observation deck of the Space Needle or spend a couple hours dining in the Needle’s rotating restaurant, and every year during the third weekend in July the Center hosts the Bite Of Seattle, a gigantic open air food festival which draws hundreds of thousands of people during its three day run. Seattle Center also plays host to the massive Bumbershoot Festival on Labor Day weekend, a kind of farewell to summer music and arts performance extravaganza featuring just about any sort of music you could want to find in one place. If you’re a professional sports afficianado, don’t move here unless you like rooting for losers. What does that mean? 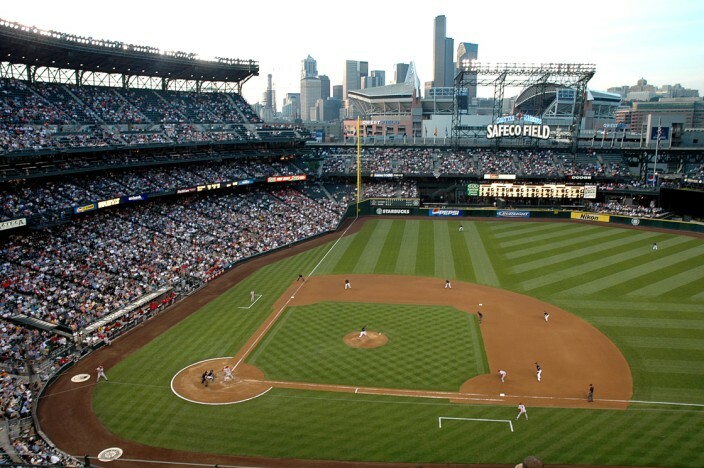 Let’s take stock: Seattle Mariners MLB team, 36 years in existence, no World Series appearances. ZERO. They are one of only two MLB teams who can claim this dubious distinction and the other, the Washington Nationals, has only been in existence for a few years; Seattle Seahawks, 35 years of NFL existence, ONE (1) Super Bowl appearance, ZERO Super Bowl wins; Seattle Supersonics NBA team (now defunct, moved to Oklahoma City), TWO NBA Finals appearances in a 41 year history spanning the years 1967 – 2008, ONE NBA championship in 1979, and still Seattle’s one and only pro sports title; Seattle Sounders, Major League Soccer franchise 2009 to present, no MLS Cup appearances as yet, although in a previous incarnation as part of the old NASL in the 1970’s and 80’s, the Sounders did play twice in the Soccer Bowl and lost both times. Seattle has never had a NHL team. So let’s total up the futility: 115 professional sports seasons competed, ONE, yes exactly one championship. That, sports fans, is pathetic, less than a one percent success rate. You should be able to do better than that just by accident. Now, I’m a lifelong baseball fan but have never really been more than a fair-weather Mariner supporter. People ask me why, and I tell them. I grew up to the age of fifteen near Chicago and was born and raised a Cubs fan. Rooting all my life for one bunch of losers is quite enough, thank you. I don’t need to bleed for two perpetually lousy teams. 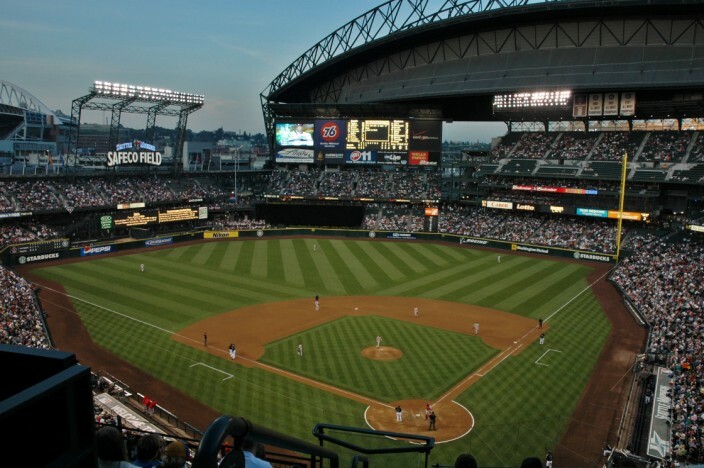 Seattle does boast two world-class sporting venues for their bumblers to showcase their ineptitude, Safeco Field, home of the Mariners, and Century Link Stadium, home to the Seahawks and Sounders. 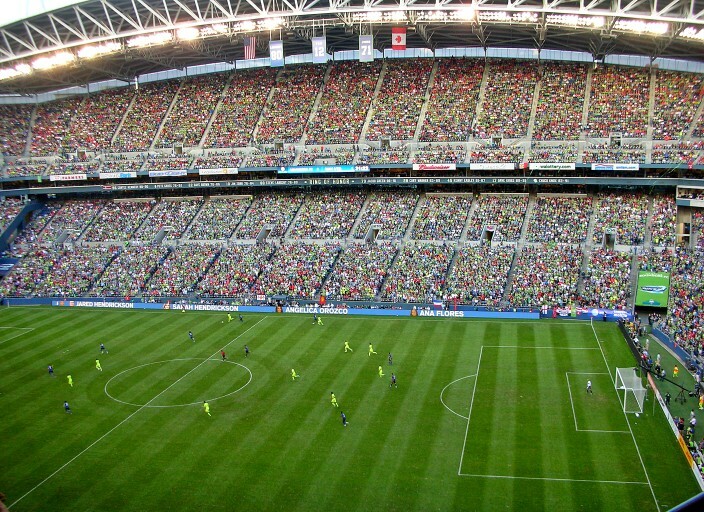 Too bad the teams that play in these stadia rarely measure up to the class of their venues. 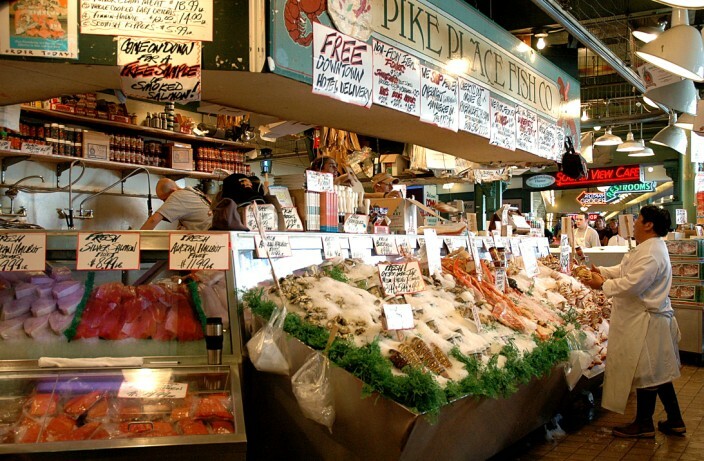 There are too many other things to do and places to visit around Seattle to list them all here, and anyway, that’s what Chamber of Commerce websites are for. But, to name a few more of my own favorites that you wouldn’t want to miss, there’s always the famous Pike Place Market with the flying salmon and the original Starbuck’s coffee shop and hordes of tourists – my advice would be don’t even go near the place on a summer weekend unless you enjoy elbowing your way through massive crowds and dealing with parking hassles. A ride on a Washington State Ferry is always fun. 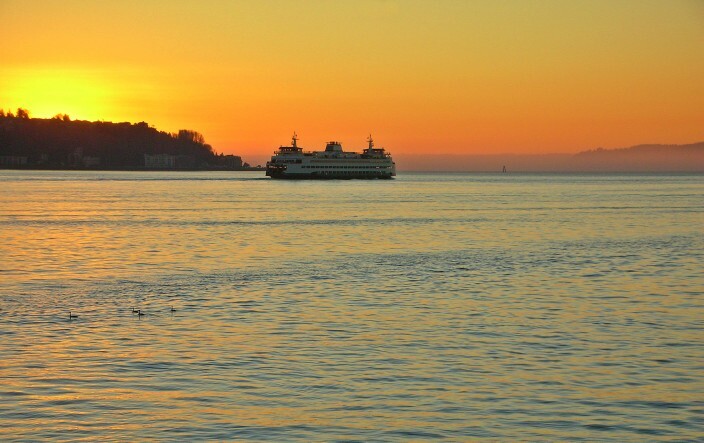 They leave from the waterfront regularly, and you can either walk on or take your car across Puget Sound to the Olympic Peninsula. 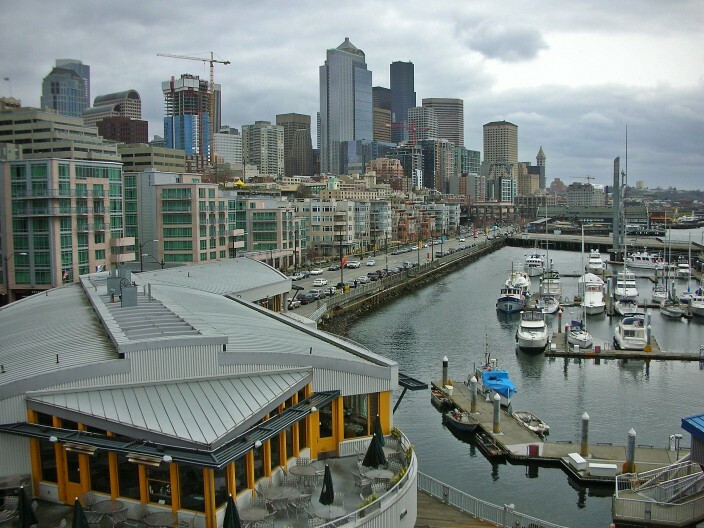 Speaking of the waterfront, it’s a great place to spend a day strolling and trolling through the shops, the Seattle Aquarium, or take a ride on the brand new (as of summer, 2012) waterfront Ferris Wheel. 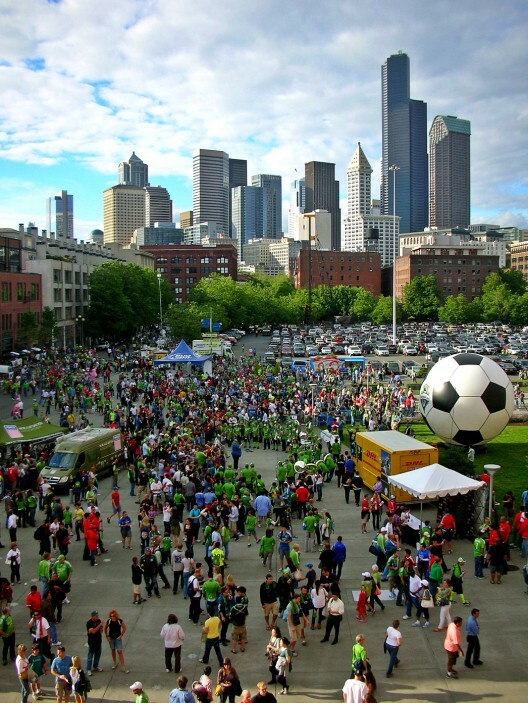 As the birthplace and headquarters of the Boeing company, you would expect Seattle to have some sort of attractions related to this industry, and you’d be right. 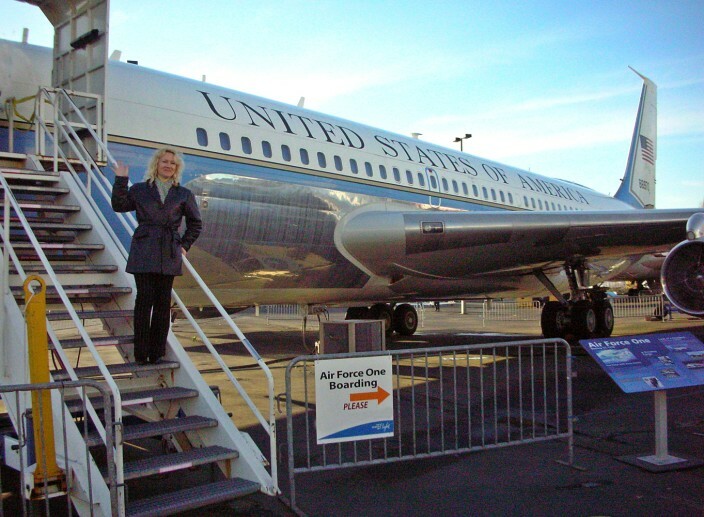 Located a few miles south of downtown near Boeing Field is the Museum of Flight, which houses more aircraft and aviation artifacts than you could ever hope to see in one place, including a Concorde supersonic jet, a retired Air Force One, NASA spacecraft and so many old airplanes there isn’t space to detail them here. 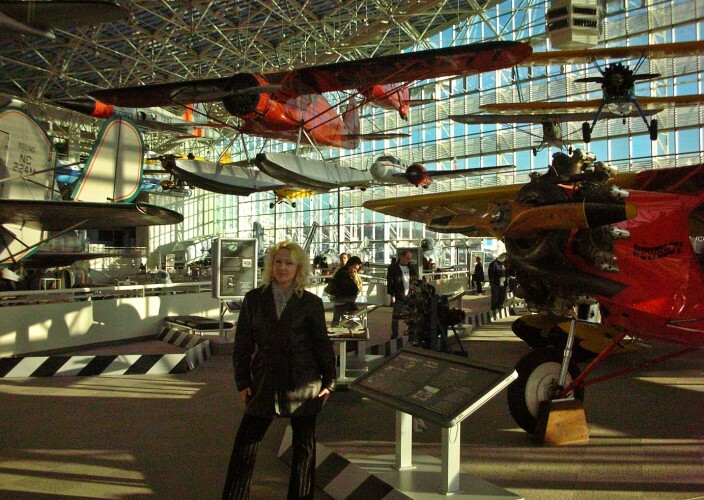 Suffice to say if you have any interest in stuff that flies, you’ll love the Museum of Flight. 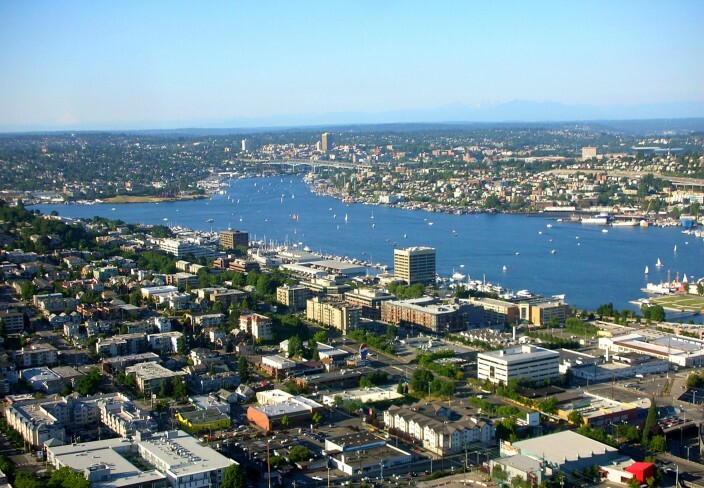 With the nearby Olympic mountain range to the west and the Cascade mountains to the east, and Puget Sound on one side and Lake Washington on the other, there is never any lack of opportunity for outdoor activities of just about any kind,not to mention the abundance of postcard perfect scenery wherever you look. 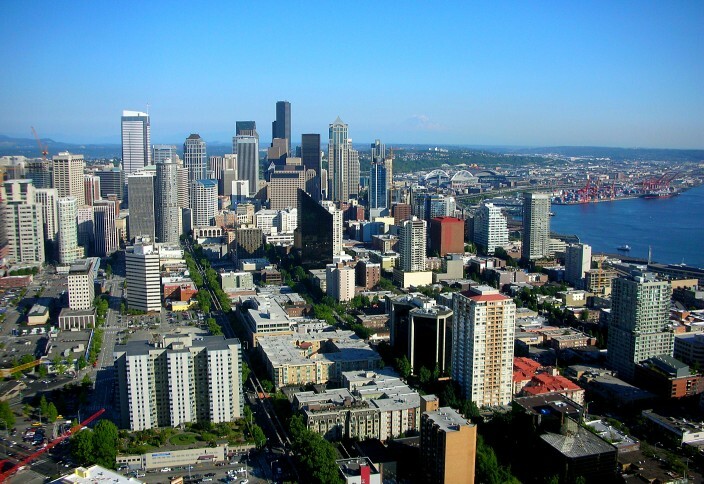 So come on by some time and check Seattle out, you’ll be glad you did.